I’m tired of all the school grounds name calling that is done in the name of “discussing” politics and speaking up to protect us. Name calling is an attempt to bully or diminish someone with demeaning language. 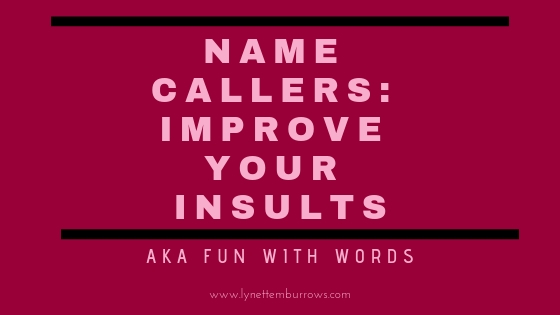 It is the least effect means of “discussion.” So I’ve decided to issue a challenge to all name callers: improve your insults. And because it’s unlikely the name callers will do research in order to improve their insults, I’m providing you with a choice of words. Drate-Poke—One who drawls or speaks indistinctly. Gobermouch—Prying person who likes to interfere in other folks’ business. Klazomaniac—Someone who only seems able to speak by shouting. Molly coddle—A man or boy used to being coddled; to pamper. Namby-pamby—Weak, insipid, indecisive; a feeble person. Niggle—To be preoccupied with trifles or petty details; to cause slight but persistent annoyance, discomfort, or anxiety; to find fault constantly and trivially. Piffle—Nonsense. To talk or act feebly or futilely. Sesquipedalian— a person who uses long words. Did you learn a new word or two today? My favorite new word is “snollygoster.” It’s fun to say. It’s my sincere hope that this was a fun read and that none of these words, or others, will be used to insult any real person. (It might be fun to use a few in one of my stories.) What about you? Did this list help you improve your insults? What fun or unusual words have you heard? ← Practicing Patience–Do You Make These Common Mistakes?